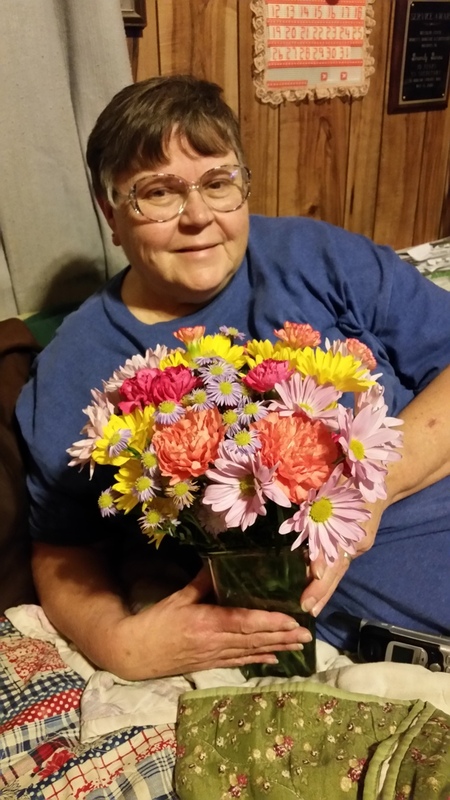 Beverly Ann (Hamilton) Burns, age 65, of Stockton, MO, passed away at Citizens Memorial Hospital on Wednesday morning, October 7, 2015, after a long battle with pancreatic cancer. Beverly was born July 20, 1950, in Cortez, CO, the daughter of Larry and Elsie (Burchett) Hamilton. They moved back to Missouri in 1964 to be closer to family, and the children became known as “dam kids”, as Larry found work building the Stockton Dam. In 1965, at the age of 15, she began dating Larry Burns. They were married May 31, 1968, just after she graduated from Stockton High School. To this union two children were born: Bradley and Becki. Early in their marriage, the family spent many weekends at the ball field watching Larry play softball for Caplinger Mills and Arcola. Bev always said the other teams didn’t mind playing the guys, it was their wives sitting in the stands that they feared. Later in life they began bowling and it became a family affair. Beverly was the local bowling association secretary for many years. She received the sportsmanship award many times and was inducted into the El Dorado Springs Women’s Association Hall of Fame. She bowled in over 35 Missouri State Championships. She considered her teammates not just friends but family and loved them dearly. Beverly spent most of her adult life working as a seamstress at Hagales and Dunbrooke. She made many friends over the years with her infectious smile and laugh. She enjoyed many things in life—from bowling, to cooking shows, to reading, but nothing brought her more joy than her four grandsons: Bryce, Bradley, Braden, and Bristol. In grandma’s eyes they did no wrong and usually got whatever they wanted. One thing they never wanted for was the love of their grandma. Preceding Beverly in death were her father, Larry; her brother, Greg; and an infant sister. Survivors include: her husband, Larry; her mother, Elsie; two sisters: Connie Mullins of Liberal, MO, and Linda McKeever of Springfield, MO; two children: Bradley Burns and wife Annette and Becki Wooldridge and husband Calvin; her beloved grandsons: Bryce and Bristol Wooldridge and Bradley and Braden Burns; four sisters-in-law: Norma Essex, Wilma Nash, Ruth Simmons and husband Kent, and Lucile Bowen; two brothers-in-law: Loyd Burns and wife Ruthie and Leroy Burns and wife Angie, all of Stockton, MO. Memorial services for Beverly Burns will be held on Thursday, October 15, at 7:00 P.M. at Bland-Hackleman Funeral Home with Rev. Brent Bland officiating. Final disposition was cremation under the direction of Bland-Hackleman Funeral Home.